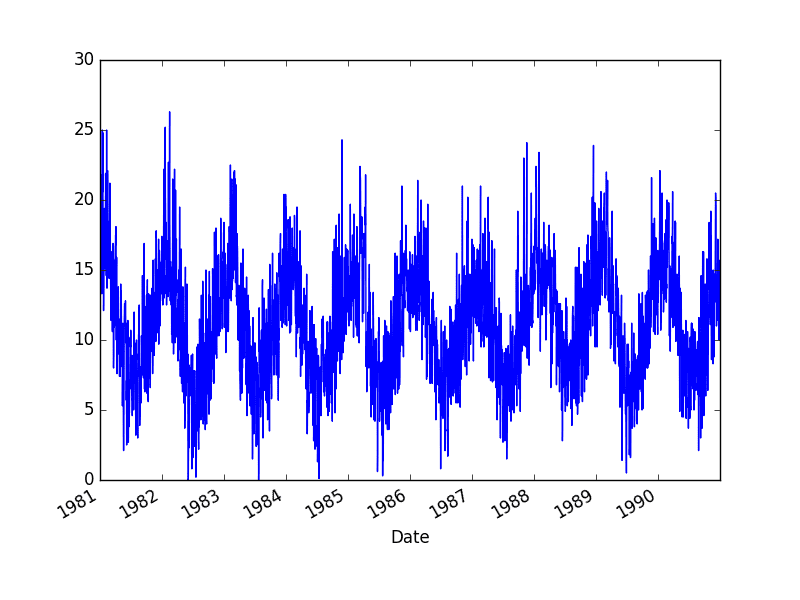 Time series datasets can contain a seasonal component. This is a cycle that repeats over time, such as monthly or yearly. This repeating cycle may obscure the signal that we wish to model when forecasting, and in turn may provide a strong signal to our predictive models. In this tutorial, you will discover how to identify and correct for seasonality in time series data with Python. The definition of seasonality in time series and the opportunity it provides for forecasting with machine learning methods. How to use the difference method to create a seasonally adjusted time series of daily temperature data. How to model the seasonal component directly and explicitly subtract it from observations. Photo by naturalflow, some rights reserved. Time series data may contain seasonal variation. Seasonal variation, or seasonality, are cycles that repeat regularly over time. A repeating pattern within each year is known as seasonal variation, although the term is applied more generally to repeating patterns within any fixed period. A cycle structure in a time series may or may not be seasonal. If it consistently repeats at the same frequency, it is seasonal, otherwise it is not seasonal and is called a cycle. Understanding the seasonal component in time series can improve the performance of modeling with machine learning. Clearer Signal: Identifying and removing the seasonal component from the time series can result in a clearer relationship between input and output variables. More Information: Additional information about the seasonal component of the time series can provide new information to improve model performance. Both approaches may be useful on a project. Modeling seasonality and removing it from the time series may occur during data cleaning and preparation. Extracting seasonal information and providing it as input features, either directly or in summary form, may occur during feature extraction and feature engineering activities. As such, identifying whether there is a seasonality component in your time series problem is subjective. The simplest approach to determining if there is an aspect of seasonality is to plot and review your data, perhaps at different scales and with the addition of trend lines. Once seasonality is identified, it can be modeled. The model of seasonality can be removed from the time series. This process is called Seasonal Adjustment, or Deseasonalizing. A time series where the seasonal component has been removed is called seasonal stationary. A time series with a clear seasonal component is referred to as non-stationary. There are sophisticated methods to study and extract seasonality from time series in the field of Time Series Analysis. As we are primarily interested in predictive modeling and time series forecasting, we are limited to methods that can be developed on historical data and available when making predictions on new data. In this tutorial, we will look at two methods for making seasonal adjustments on a classical meteorological-type problem of daily temperatures with a strong additive seasonal component. Next, let’s take a look at the dataset we will use in this tutorial. Below is a plot of the entire dataset taken from Data Market where you can download the dataset and learn more about it. The dataset shows a strong seasonality component and has a nice, fine-grained detail to work with. Download the Minimum Daily Temperatures dataset and place it in the current working directory with the filename “daily-minimum-temperatures.csv“. The code below will load and plot the dataset. Running the example creates the following plot of the dataset. A simple way to correct for a seasonal component is to use differencing. If there is a seasonal component at the level of one week, then we can remove it on an observation today by subtracting the value from last week. In the case of the Minimum Daily Temperatures dataset, it looks like we have a seasonal component each year showing swing from summer to winter. We can subtract the daily minimum temperature from the same day last year to correct for seasonality. This would require special handling of February 29th in leap years and would mean that the first year of data would not be available for modeling. Below is an example of using the difference method on the daily data in Python. Running this example creates a new seasonally adjusted dataset and plots the result. There are two leap years in our dataset (1984 and 1988). They are not explicitly handled; this means that observations in March 1984 onwards the offset are wrong by one day, and after March 1988, the offsets are wrong by two days. One option is to update the code example to be leap-day aware. Another option is to consider that the temperature within any given period of the year is probably stable. Perhaps over a few weeks. We can shortcut this idea and consider all temperatures within a calendar month to be stable. An improved model may be to subtract the average temperature from the same calendar month in the previous year, rather than the same day. We can start off by resampling the dataset to a monthly average minimum temperature. Running this example prints the first 13 months of average monthly minimum temperatures. It also plots the monthly data, clearly showing the seasonality of the dataset. We can test the same differencing method on the monthly data and confirm that the seasonally adjusted dataset does indeed remove the yearly cycles. Running the example creates a new seasonally adjusted monthly minimum temperature dataset, skipping the first year of data in order to create the adjustment. The adjusted dataset is then plotted. Next, we can use the monthly average minimum temperatures from the same month in the previous year to adjust the daily minimum temperature dataset. Again, we just skip the first year of data, but the correction using the monthly rather than the daily data may be a more stable approach. Running the example again creates the seasonally adjusted dataset and plots the results. This example is robust to daily fluctuations in the previous year and to offset errors creeping in due to February 29 days in leap years. The edge of calendar months provides a hard boundary that may not make sense for temperature data. More flexible approaches that take the average from one week either side of the same date in the previous year may again be a better approach. Multiple day level, such as a week or weeks. Multiple week level, such as a month. Multiple month level, such as a quarter or season. We can model the seasonal component directly, then subtract it from the observations. The seasonal component in a given time series is likely a sine wave over a generally fixed period and amplitude. This can be approximated easily using a curve-fitting method. A dataset can be constructed with the time index of the sine wave as an input, or x-axis, and the observation as the output, or y-axis. Once fit, the model can then be used to calculate a seasonal component for any time index. In the case of the temperature data, the time index would be the day of the year. We can then estimate the seasonal component for the day of the year for any historical observations or any new observations in the future. The curve can then be used as a new input for modeling with supervised learning algorithms, or subtracted from observations to create a seasonally adjusted series. Let’s start off by fitting a curve to the Minimum Daily Temperatures dataset. The NumPy library provides the polyfit() function that can be used to fit a polynomial of a chosen order to a dataset. First, we can create a dataset of time index (day in this case) to observation. We could take a single year of data or all the years. Ideally, we would try both and see which model resulted in a better fit. We could also smooth the observations using a moving average centered on each value. This too may result in a model with a better fit. Once the dataset is prepared, we can create the fit by calling the polyfit() function passing the x-axis values (integer day of year), y-axis values (temperature observations), and the order of the polynomial. The order controls the number of terms, and in turn the complexity of the curve used to fit the data. Ideally, we want the simplest curve that describes the seasonality of the dataset. For consistent sine wave-like seasonality, a 4th order or 5th order polynomial will be sufficient. Where y is the fit value, x is the time index (day of the year), and b1 to b5 are the coefficients found by the curve-fitting optimization algorithm. Once fit, we will have a set of coefficients that represent our model. We can then use this model to calculate the curve for one observation, one year of observations, or the entire dataset. Running the example creates the dataset, fits the curve, predicts the value for each day in the dataset, and then plots the resulting seasonal model (red) over the top of the original dataset (blue). One limitation of this model is that it does not take into account of leap days, adding small offset noise that could easily be corrected with an update to the approach. For example, we could just remove the two February 29 observations from the dataset when creating the seasonal model. The curve appears to be a good fit for the seasonal structure in the dataset. We can now use this model to create a seasonally adjusted version of the dataset. The seasonally adjusted dataset is then plotted. In this tutorial, you discovered how to create seasonally adjusted time series datasets in Python. The importance of seasonality in time series and the opportunities for data preparation and feature engineering it provides. How to use the difference method to create a seasonally adjusted time series. How to model the seasonal component directly and subtract it from observations. Do you have any questions about deseasonalizing time series, or about this post? Is it right that after substracting sine which represents year cycle impact we’ve got values of deviation of daily temperature from its average? I just trying to understand what this result values mean. like your posts! These first order difference values can then be used to fit a model. The model can then be used to make predictions, and the seasonal component added back to the prediction for a final usable value. Definitely! Thanks. I think another possible method for feature engineering would be using empirical mode decomposition algorythm to extract different signal components to be used in fitting model, will test it. Can you be more specific how to add the seasonal component back..? I couldn’t see how to preserve this seasonal component during deseasonalizing… Or I missed something… if so, please indicate where it is. Thank you…! If you seasonally adjust by subtracting data from 1 year ago, you can reverse it by adding the subtracted value back again. Thanks for the link augmentale. I have seen where people use decomposition and take error/residual part to remove trend and seasonality. How to choose which method/technique to use to remove seasonality/trend? Decomposition is good for time series analysis, but generally unusable for time series forecasting. At least as I understand it. I would suggest trying a suite of methods and see what works best – results in models with the most accurate forecasts. I have to predict 3 day household electricity demand @ 12 hour interval for next 3 days (6 data points). I have ~ 3 years of data at 12 hours interval. On face of it, it looks as if there could be multiple seasonal patterns.How can I identify complex seasonal periods?What could be the best approach in that case? Try fitting some polynomials perhaps? I have a data which has multiple seasonalities .is there any way to identify all the seasonalities.I have tried sesonal decompose but we need to pass the parameter for Monthly, weekly or yearly My case we I need to identify all the seasonalities occurs in my data . Perhaps look at a graph and use seasonal differencing to remove each in turn. I cannot see the benefits from deseasonalization if i want to predict certain value. Im missing this information if i do it. The model for the seasonality is easy, so we model it and remove it. Then, we want to add more value on top of that. Sorry, I don’t understand your question. Perhaps you can restate it? Good question, you can save the data to a CSV file. can we use this technique to compare signals with different lengths? For eg. Signal A is recorded for 5 sec, signal B is recorded for 1 min. If we want to compare these 2 signals, can I use your idea to remove the seasonal components of the longest signal? Sorry, I’m not sure I follow. Perhaps try it and see. Great post. Thank you very much Jason. I also followed your ARIMA post and wondering if ARIMA can handle it all (including seasonality) so we don’t necessarily have to isolate out and handle seasonality and do ARIMA on the seasonality-adjusted data. Because technically seasonality is a special form of auto-correlation and can be handled by differencing. am I thinking correctly? Your models will perform better if you remove systematic patterns from the data such as trends and seasonality. People like you who take the time to post methods & examples like this make life a heck of a lot easier (and less frustrating!) for people like me who need to extract valuable information from datasets using techniques that we aren’t necessarily trained in. And consequently, you make the world a better place for us! I’m glad I could help Ian! how can I use this for weekly and annually seasonality? You will need to modify it accordingly. multiple seasonality in same data series? This is a great example – thank you. The examples are quite mechanical – thus good for general audience. Just wondering if/why_not considered using pandas.groupby and .transform methods? How do you think I should use those methods in the above tutorial? 1) Is it already neccessary to remove the trend and/or seasonality from the timeseries data before applying the SARIMAX (seasonal arima) model? 2) How can I statistically know whether the timeseries data is stationary or not? That is using adf.test and if the p-value>0.05 can I assume the data is not stationary? 3) Last one; is it neccessary to make the data stationary if any other models are used like HoltsWinter or Exponential Smoothing etc? It can help to remove structure like trends and seasonality. The problem will be simpler and model skill higher. But it is not required to perform these operations. Again, the series does not have to be stationary, but most methods assume it and in turn model skill will often be higher if you meet the assumption. Do we need remove seasonality before performing deep learning methods, like MLP or LSTM? Anything we can do to make the problem simpler for the model is a good idea. I coppied the code from the first window straight into jupyter notebook running on Ubuntu and I get 2 errors. 2. I also get an indexing error. Hi, I was wondering if you can suggest any method to predict the start date of the seasonality. For example, the start date of summer or winter. It really depends what ‘start’ means for your problem. You must define start, then you can predict it. How would I define the weekly seasonality in my model using Minitab? Is it define as S=4? I have a seasonality from Aug to Feb each year. Eg. Do I need to consider the lag as 6 or 7 ? Please suggest. Also, on top of the differentiated data set we need to perorfm trend removal, then Feed it to the ARIMA model? Sorry, I cannot analyse the seasonality of your data for you. What if the “seasonal” component is not fixed, that is, the length of each cycle changes? An example of this is the sunspot number, which is not exactly 11 years, but changes from cycle to cycle. How to remove the cyclic component then? Great question, time series gets tricky. May I ask you quick question? I am confused with deterministic trend/seasonality and stochastic trend/seasonality. It is ok to get rid of deterministic trend/seasonality first and then proceed multiplicative SARIMAX modeling process? I am not sure data can have both of deterministic & stochastic trend/seasonality at the same time.